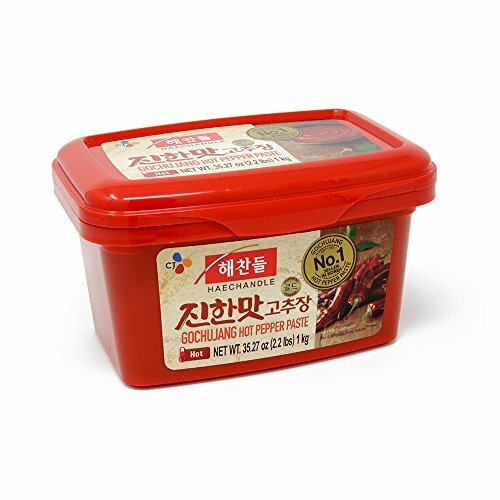 Gochujang is a savory, sweet and spicy condiment made from red hot chile peppers, glutinous rice, fermented soybeans, salt, and more. 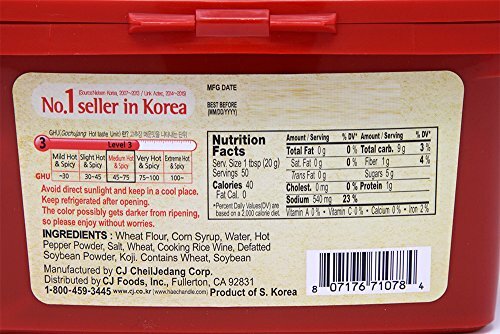 Perfect for making spicy Korean dishes such as bibimbap, kimchi stew, spicy chicken wings, and super good on popular food items like hamburger, tacos, pork belly, ribs, and vegetables. Made from only the quality chile peppers and fermented under proven optimal conditions. Product of CJ, No. 1 Food Company in Korea. Contains a 1kg (2.2 lb) container.